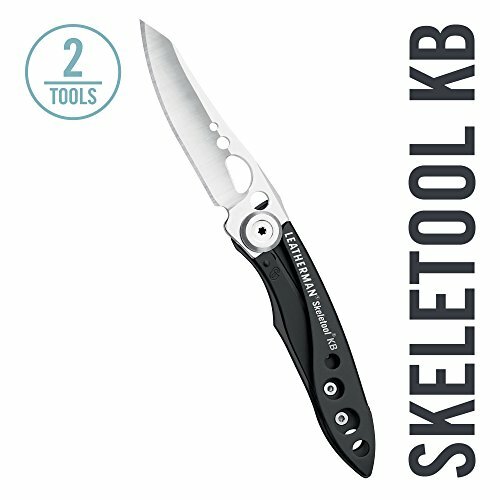 Following in the footsteps of the Skeletool Family, the Skeletool KB is a slim and lightweight knife that focus on the essentials. Made with 420HC stainless steel and featuring a comfortable, contoured grip with BottleClip. READY FOR ANYTHING: The Skeletool KB is the perfect lightweight everyday carry knife. Slice through your work with ease, then pop open a cold one to toast your next favorite multitool. JUST THE ESSENTIALS: The Skeletool KB is equipped with just 2 tools: a knife and a bottle opener. What more could you need? SAFE AND SECURE: With a blade that locks when opened, you can cut with confidence. Simply press on the blade lock to unlock and close. ALWAYS ON HAND: The Skeletool KB's bottle opener doubles as a pocket clip so it never has to leave your side. The KB weighs only 1.3 ounces, making it perfect for pockets and backpacks.